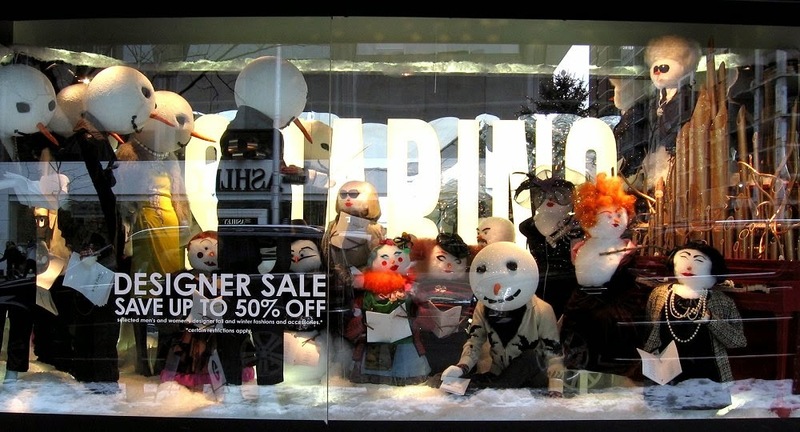 Well, I finally have had a chance to see the Holt Renfrew Christmas windows. Holt Renfrew sell designer labels and is on Toronto’s most expensive street. The attention to detail and the top quality in the windows is an absolute delight. 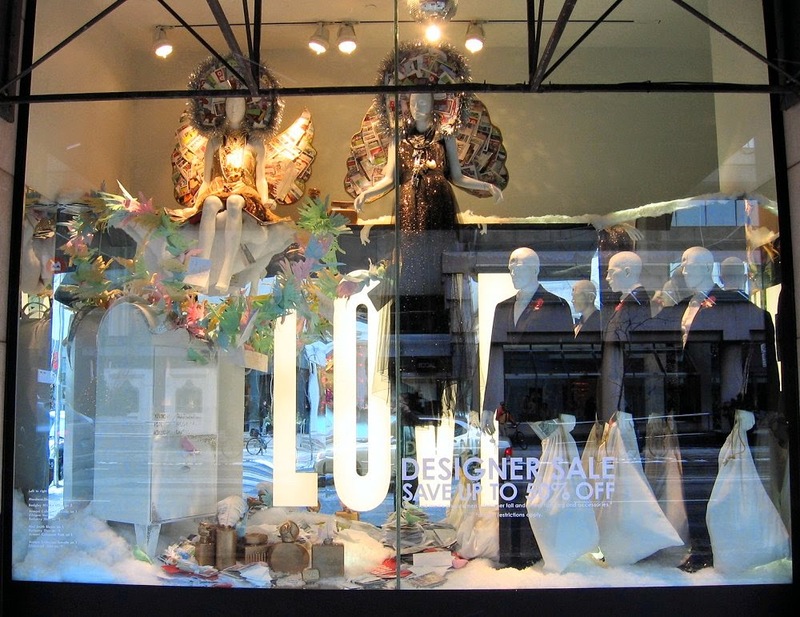 This year's themes running through the window displays are words describing the holiday season and images of Christmas and winter. Most of the mannequins in the window displays have had their heads replaced. This window has two angels with Christmas card halos and wings. The three male mannequins (three wise men?) are in suits with sacks of mail or gifts. In the background is the word LOVE. 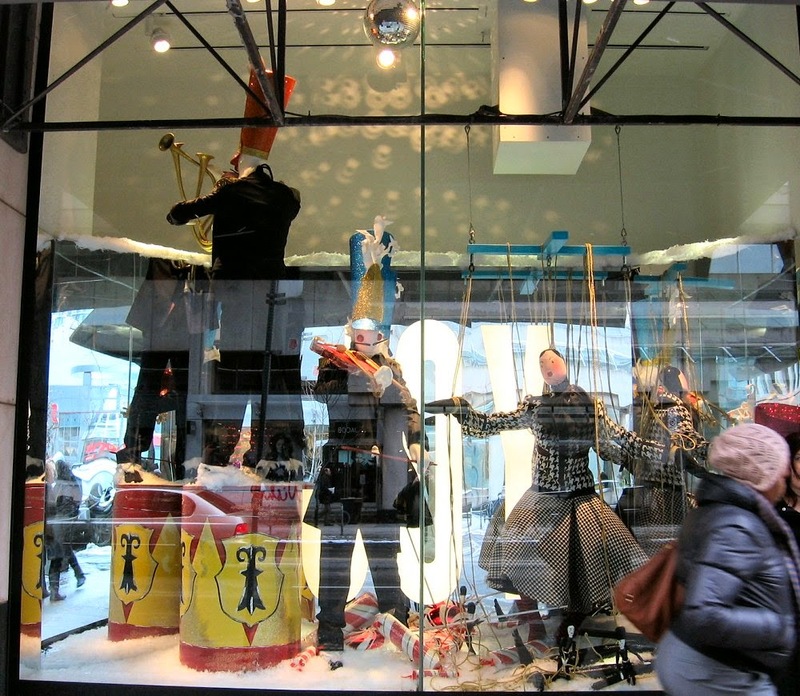 This window has the male mannequins with toy soldier heads and the female mannequins have marionette heads. The word JOY is in the background. The detailing with accessories is what sets these windows apart. The lone male mannequin has his head replaced with the amazingly realistic head of a black swan while the heads of the female mannequins are replaced with the heads of white swans. The word in the background is BEAUTY. A holiday cocktail party is in progress with the word MAGIC in the background. The gigantic word WONDER dominates this window. 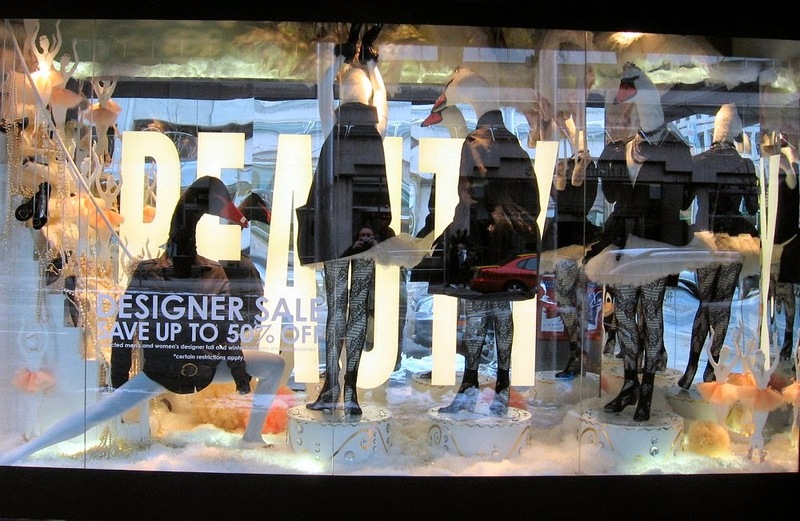 The female mannequins are facing the word and have antlers attached to their heads creating a sense of mystery and excitement. The mannequins all have beautifully modeled penguin heads in place of their human heads. If only we could change our heads like we change our cloths! Following along with the mannequins is a flock of penguins. The word in the background is WARMTH. The school Christmas concert has all of the mannequins with snowman and snowlady heads and the word SHARING in the background. 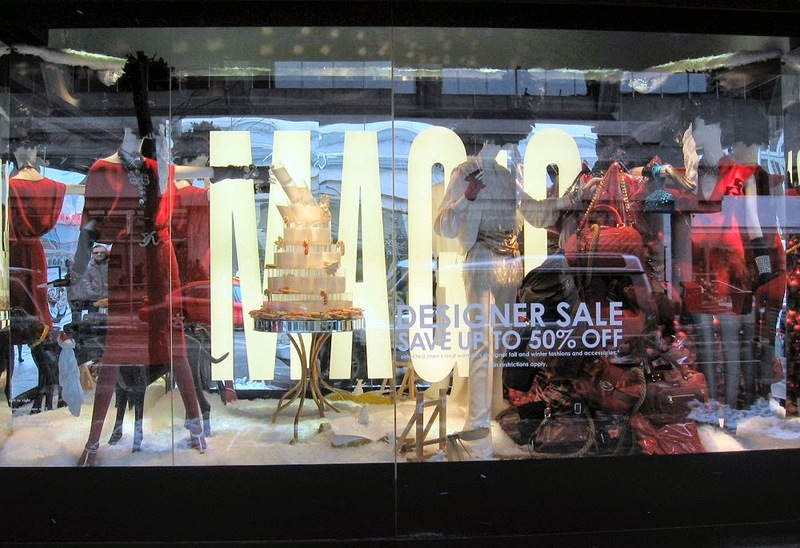 These last two windows were on either side of the store entrance. 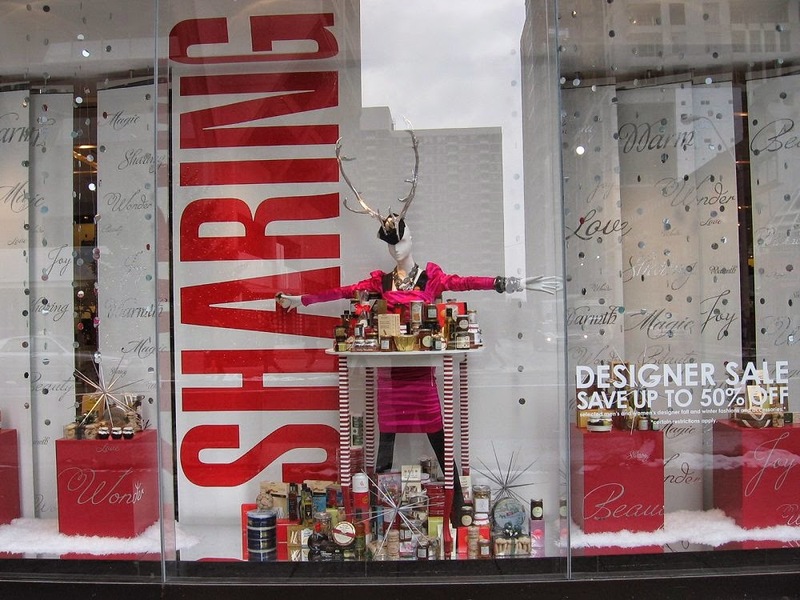 They are a little more traditional department store in their presentation with the giant word SHARING behind the mannequin sporting a set of antlers and the merchandise piled on the large cubes. The cubes and the background panels have all of the words from the various windows printed on them. 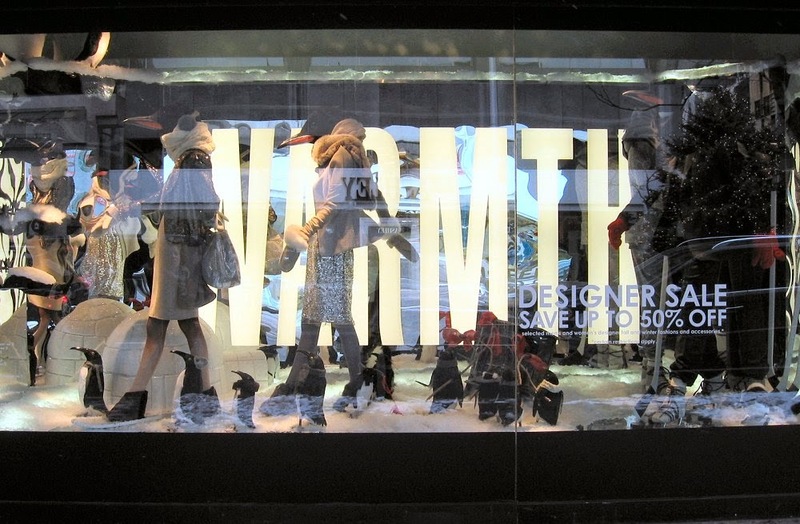 The other window in the store entrance set has a snowlady sitting on the floor with the word SHARING in behind her. 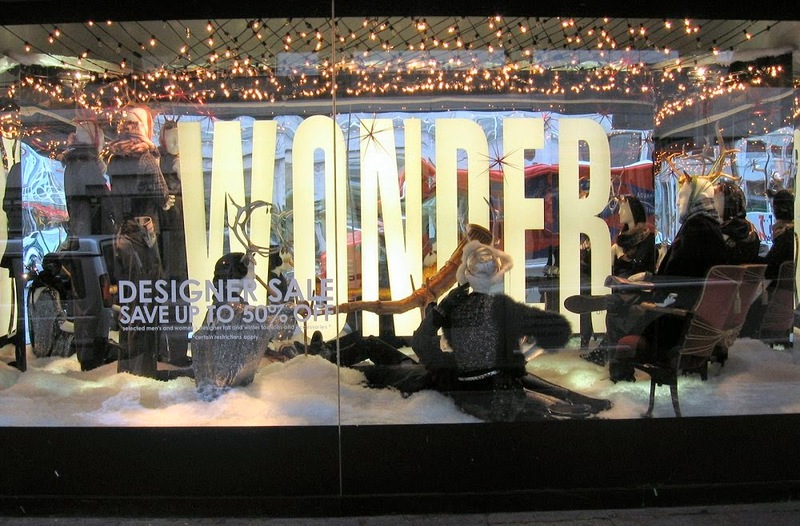 The last set of window displays will be from the Toronto Eaton's Centre.